Since 1985 we have been innovators in the field of the production of corn leaves. Thanks to our efficient quality control system, we can offer our clients a product guaranteed to meet their needs. Our registered trade mark “Lucero” can be found in the leading supermarkets in the USA and Mexico. The corn leaves come from a plant which scientific name is “Zea Mays” from the Greek name “zeo” which means “to live”, and the word Taína (a language used by Caribbean Indians) “Mahís” which means “corn”. Corn is from the family of gramineas (grass) called “Zea Mays” (link to etymology). Corn is harvested once a year and the stem reaches a height of two and a half meters. The bark of the corn plant is solid, hard and straight and it is composed of three layers. The leaves are large and narrow, narrowly wrapped around the stem, which is where the cob grows. Each cob is composed of an ear, a white pithy substance, round which the grains adhere in regular rows. Each corn plant has between eight and thirty cobs, which form the edible part of the plant. Corn leaves come from the maize plant, which is primarily known for its ears of corn. Corn is from the Americas, introduced to Europe in the 16th century. Today it is the most widely produced cereal in the world. The U.S.A. is the biggest producer with 45% of the world’s production. It is also grown throughout Latin America. Along with beans, squash and chile, it is one of the dietary staples of America. The consumption rate of corn is the highest in Mexico, Guatemala, El Salvador and South Africa. In Mexico, “tamales” (link to CORN LEAVES/in the kitchen) are wrapped in dried corn leaves. The steam from the dough absorbs the flavor of the leaves and it keeps the tamales warm. Because of the cultural interaction between the U.S.A. and Mexico, tamales have become a common and very popular dish in the U.S.A. The oldest reference to the cultivation of corn was discovered by a group of American investigators on the southern coast of Guatemala. There is evidence that the Mayans were cultivating corn as early as 5000 B.C. Corn has also been found in caskets excavated from the pre-Columbian Incas. Furthermore, the predominant Mexican cultures that introduced corn to other cultures and regions also passed on their cooking recipes. The leaves that cover the husk are not edible, but they have other purposes. After harvesting, the bottom of the husk is cut so that the leaves fall off and are packed in blocks for easier storage and transportation. Afterwards the leaves are washed and get a white color. Depending on the quality required, each leaf will be selected manually. In the kitchen corn leaves are used to wrap warm dishes such as fish, meat, or different traditional dishes prepared from corn. In Mexico the dried corn leaf is also used to create handicrafts. In Central America the dried corn husks are frequently used to add flavor to dishes, one of the most popular being the “Tamal” (Spanish form of Nahuatl “tamalli” that means “wrapping”).It is a general name used for all kinds of dishes, from native origins, usually prepared from steam-cooked corn dough (mass), with or without a filling, that is wrapped in leaves of one of following plants: maize, plantain, bijao, maguey, avocado; or simply wrapped in aluminum foil of plastic paper. Tamales can be filled with meats, vegetables, chilies, fruit, sauces or any preparation according to taste, which may be sweet or salty. The wrapping and filling methods depend of the region. No other country has such an extensive variety of tamales as Mexico. Almost every region and state has its own kind of tamale. It is said that there up to 5000 different types of tamales all around the country. Some experts estimate the annual consumption in hundreds of millions every year. The corn plant is an important organism that is studied as a model in genetics and in evolutionary biology. “PANELIN” was one of the first registered trademarks of this product to be sold in the U.S.A., satisfying the demand of the large Hispanic population living there. We sell from one box to a full trailer load to anywhere in the U.S.A. The word “sugar” comes from the Sanskrit “Sharkara” (600 B.C.). Sugar cane,”Zaccharum Officinarum” in Latin, is any of six to thirty-seven species (depending on taxonomic system) of tall perennial grasses of the genus Saccharum (family Poaceae, tribe Andropogoneae). They have stout, jointed, fibrous stalks that are rich in sugar, and measure two to six meters (six to nineteen feet) tall. All sugar cane species interbreed, and the major commercial cultivars are complex hybrids. The sugar cane plant continuously sprouts and is harvested between its eleventh and seventeenth month. Nevertheless, the plant’s roots get damaged by the successive cuts. This will determine the life span of the plant, which is up to ten years. GEOGRAPHIC ORIGIN The sugar cane is brown in tropical and subtropical zones of the world. The biggest producer is Brazil followed by India. The most popular “sugar cone” producer is India where it’s known as “gur” o “jaggery”. 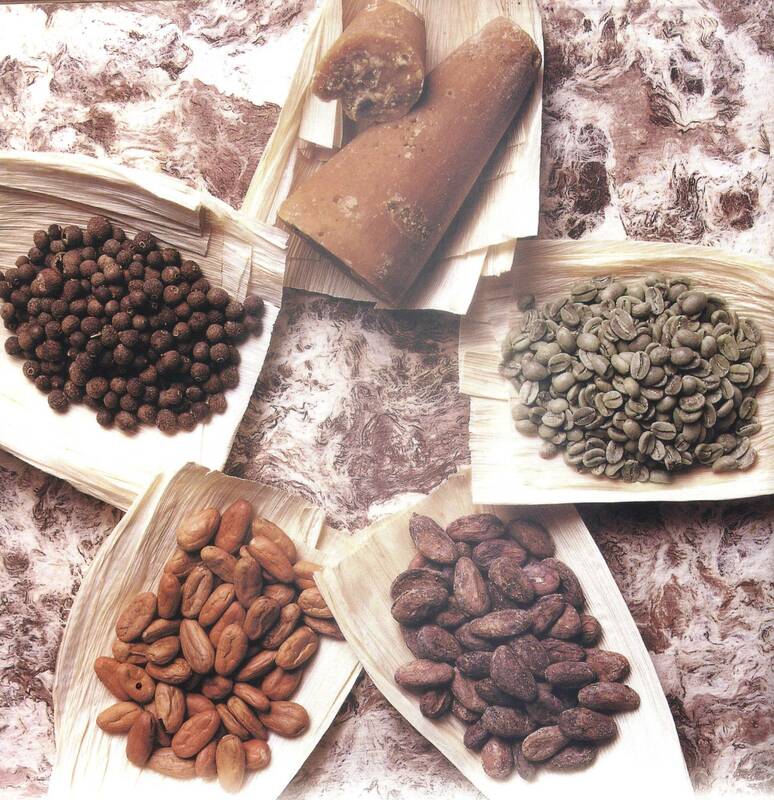 The second largest producer of piloncillo is Colombia, which has at the same time the highest consumption rate per person. HISTORIC ORIGIN Sugar cane originated in New Guinea where it has been documented since about 6000 B.C. starting from around 1000 B.C., its cultivation gradually spread along human migration routes to Southeast Asia and India and east into the Pacific. During the Islamic expansion westwards, sugar cane was introduced to the European continent between 600-1400 A.C. Finally, the Spanish explorers brought the plant to America in 1493. At first sugar cane was only used for chewing, but around 1000 B.C. Indians had discovered how to obtain sugar from the cane through a boiling process. PRODUCTION PROCESS At their 11th to 14th month the stalks are ready to be harvested. Usually the stalks are cut manually after being burned, but some use cutting machines which thereupon separate their leaves through big fans. Afterwards, the product is immediately transported for processing, to prevent yeast or bacteria. To extract the juice the branches are pressed three to four times, adding water to extract more. The thick green liquid is passed through a strainer, clarified and crystallized. The brown sugar, called “piloncillo” or “panela” in Spanish, is made by boiling the cane juice to high temperatures until it becomes dense syrup. It is then poured into molds and hardened. In this process three copper or bronze pots are used. In the first pot the boiling of the extracted juice starts, the second pot is used to collect the froth and impurities of the first boiling process and in the third pot even more impurities are collected. The first pot will contain a hard mass of excellent quality with a semitransparent brown, almost orange, color. Frequently “panela” is used to treat colds, through a hot “brown sugar water” with lemon. Sportsmen drink it cold to replenish calories and salts. Actualmente importamos y exportamos una gran variedad de productos agrícolas en México y en el mundo. ¿Por qué no te pones en contacto con nosotros?